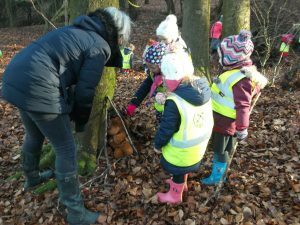 Reception started the year with a frosty walk to Savernake Forest. Here we acted out the story of Goldilocks and the Three bears. It was then time to go and hunt for bears and we found lots hiding in the trees and undergrowth. As the bears were quite tired after their ordeal it was time to build them a Bear Cave for them to have a sleep in. 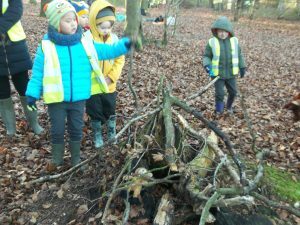 We had to work together to find enough sticks and leaves to cover the bear, with an opening for them to get inside. 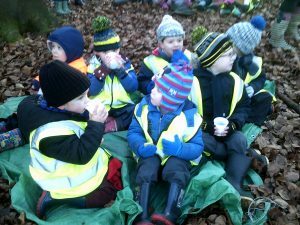 Soon it was time for a treat for us: hot chocolate and a biscuit were waiting back at our forest glade. 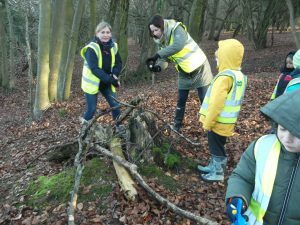 We had a wonderful morning, a true test of our resilience and group working skills. Marlborough St Mary’s Primary School is committed to providing a safe, supportive and inclusive environment, which secures the well-being and very best outcomes for the children in our care. Safeguarding and promoting the welfare of children and young people is the responsibility of everyone involved with the school and we expect all staff, governors, parents, carers, volunteers and visitors to share this commitment. If you are concerned about the safety and welfare of any child do not hesitate to come into school and speak to one of the Safeguarding Leads or a member of the senior leadership team. You can also report your concerns to the Multi-Agency Safeguarding Hub (MASH) on 0300 456 0108. The School’s safeguarding governor is Mrs Joyce White.